Extend A Visor™ instantly blocks glare from the sun's harsh rays! Straps around visor; extenable visor panels slide right or left to block early morning and late day sun. Tinted shield pulls down to reduce eyestrain when driving. No negatives, when you live in Florida it's a necessities. This is intended as a gift to a friend that is very short. Her flip-down visor does't protect her enough due to her size. I haven't given it to her yet to know if she will enjoy it or not. The visors in our van miss providing shading in the middle and naturally that is where the sun comes in. Now we can drive, and ride, without squinting from the glare. really helps with that spot between visor and mirror. The sun wants to sneak under ordinary visors to blind you in early morning commute. This Godsend is the answer to comfortable driving. The morning sun in my area caused me to have a need to order this item. Delivery was good. Great to control sun glare . Very versatile, for front and side windows, even for the space "in between" windows. Occassionally it slides by itself, which is why I gave it only 4 starss. It does not bother driving, but could be annoying. However, the best solution for the glare problem that I found until now. I will buy another one for my use. I purchased this product for a gift. My Mother has diffuculty seeing with the sun and her visor is small. She is very pleased and said it helps her while driving. I am ordering another one for the passenger's usage. I travel by car a lot and have used this item on numerous occasions. Personally, I have never had it interfere with my vision, just save me from the horrible glare of a setting or rising sun when I cannot see at all otherwise. The slide works great but one can adjust distance or it may interfere with mirror. I just rely on my sideview mirrors at such a time, better to have blinding sun blocked. Best solution I have found thus far! Really cuts down on the glare of morning sun. Works well when visor is moved to the side window. Only problem is having to click hard the front extension back into place. Great especially when the sun is in unusual places and you are being blinded. It is a little flimsy and this makes it harder to use. Could use a more sturdy model made of better materials. Would pay more for a really sturdy model because the ides is good. Better then I thought it would be! Had some difficulty putting it together. The holes for the plastic ties needed to be enlarged with a sharp blade. Like the way it decreased glare from sun low on horizon. Dislike the way the pull down visor will not stay up. As the passenger I use this item on a regular basis. It really helps keep the sun out of my eyes which are very sensitive to sunlight. This serves its purpose which is to keep the sun out of my eyes. My passenger seat sits very low and is not adjustable for height like the driver seat. I am short and the cars passenger visor does not block the sun. This works great for me. The only drawbacks are the cheap plastic ties that hold it on the visor and the tinted visor makes vision distorted, so I don't know if it would be suitable for the drivers side. Other than those two issues I am glad I purchased it. Not as easy as pictured!! No, I don't like this as much as I thought I would. I was mislead that it was a set meaning two. I wanted one for each viser in the car, I feel I was ripped off and mislead. Needs to be darker plastic to block sunrise/sunset. Good for daytime. Needs easier assembly such as elasticize do bands on each end. Hard to insert plastic strips in small slots & adjust. Comes with plastic strips to install and they won't tighten up and/or stay that way. It is very cheaply made. The piece that slides out to block the sun behind the rearview mirror just blocks the mirror and if not careful slides out, there is nothing to stop it. The way it attaches to the visor is with the plastic ties normally used to secure boxes by retailers when they ship boxes. Once you figure out how to attach them its very hard to tighten it. The extender part is long enough but not low enough. The piece that pull down to block the sun falls down on its own occasionally. My daily commute is East in the am and West in the pm. The visor helps when the sun is shining directly in my eyes. However, the construction is somewhat flimsy, the sun shade shakes when the highway is not smooth and I have to place my finger on the shade to keep it from distorting my view. I also found the visor difficult to install. The nylon straps were hard to manipulate. An upgrade of the installation process would be preferred. When installed and the shield in pulled down there is not enough coverage on the sides. Would be useful if I could get it attached to my visor. The instructions for installing the straps onto the shield were so complicated that I had to get someone else to help me figure them out. He installed one for me, but I have yet to get the 2nd strap looped through the holes because it's too difficult to get the strap through the tiny slits. I tried to attach the shield to my visor with the one "working" strap and the one that was loosely attached. Even if both straps were on the shield correctly, tightening it to the sun visor was also very difficult. I'm going to see if I can find one somewhere else that's better designed. Awkward placement. Straps not secure. Covers vanity mirror. I think the product would have been great if it would have fit my car. If plastic visor was made clearer and longer, it might have worked out. the plastic straps need a long one to connect the side, visor slips off car visor. Should have velcro straps to allow adjusting. I regret buying it. This is a terrible product. I used it on a car trip, and it was like looking through a funhouse window--everything was warped. I could not use it for more than a few minutes at a time since it distorted my perspective. And the piece that slides out horizontally slid right over my rearview mirror! The piece that slides down does not stay back up, especially if the horizontal piece is out. Very cheaply made, too. And those straps! Difficult to install. Why not just have clips? This product should not even be on the market! Returned item. Could not pull the side "extender" either to the right or left. I had hoped to use this in my car after having this feature in a rental car visor. Found that my visor was about 1/3 shorter. That made the use of this product impossible as the slide-out on either side ran into either the rear-view mirror post or the side of the car. I was very disappointed. My car is 12 years old and the rental car was a 2015. Don't know if all new car visors have this feature or what car this product will fit. The plastic straps are anything but secure. Maybe my visors are weird, Ford Escape. A poor investment of my money. 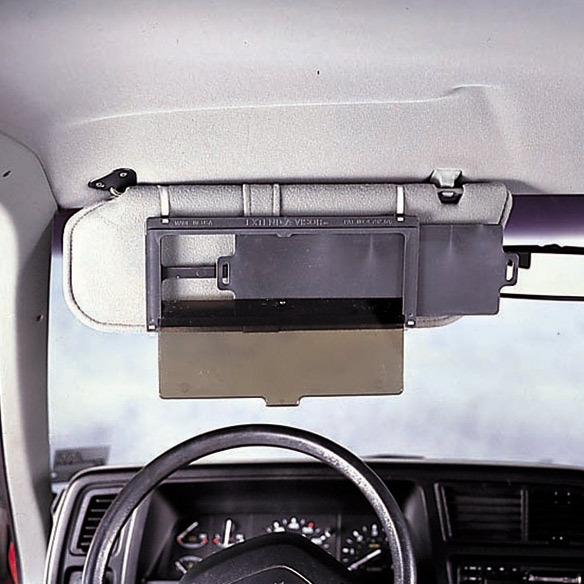 Product is cheaply made, sun visor distorts vision, side visors do not open and close easily, the plastic straps don't hold product securely so it shifts. Used it for two weeks and just had to toss it. The review that said "Good for short people" convinced me that this one was for me. I'm very short and there are blind spots. This should fix the problem. Was not happy with this item. I bought one for my daughter and am impressed with how well it works. No more blindness from sun that can't be blocked. Very pleased with this item. My wife has one and I liked it. I have a Ford Focus and a postage stamp for window visor. I am hoping that this will extend and block the sun on the side window and hopefully last. I will see how it works out. TO HELP KEEP SUN FROM MY EYES. This is good for short people like me. Visors in car don't cover enough area. sometimes when driving during sunset i put my visor to the side but its too short to block the sun. keep the sun out of my eyes Duh!!! Sun glare is very hard on my eyes. This will be a hugh help. I already have one and it works good. My wife wants some for her car also. MY MOM HAS A HARD TIME SEEING IN THE SUN, This helps her. when i drive, i drive a lot during late afternoon and go west so i'm going right into the sun hope this helps. Unable to find a double visor sun shade in the stores. short passenger receives no protection from sun without an extension on visor. New car doesn't have the pull out sun shade for the left and right side of visor. to stop the sun from getting in my eyes. It looks like it will be just what I need! Being able to deflect sunlight while driving is important for a person of short stature. Needed to block sun between visors. Visors in van are too short in length. I like the side to side extension to block the sun glare. Sun gets me every time I drive home from town. I am hoping that this will help. I drive a lot at all hours and this is a safety factor. I have sensitivity to the sun while driving. Driving to work during daybreak and sometimes sunset, this should block the direct light from the sun. BEST ANSWER: Thank you for your question. 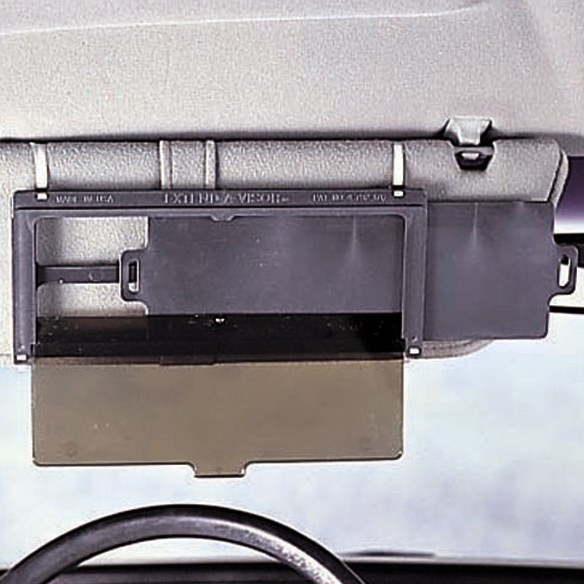 The visor extender is 13.50" x 5.75" x .75". We hope this information will be of help to you. is the extender a see through?